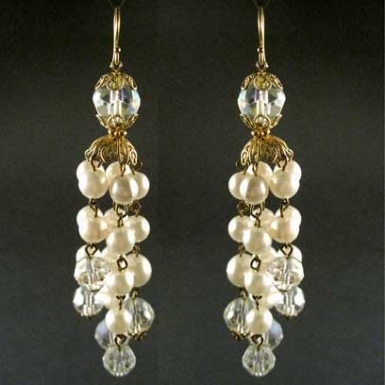 One-off Extravagant dangly earrings handcrafted from vintage faux pearls and and pearl and crystal bead chain. Length from top of earwire to bottom of earring is 11cms. Earwires are 14k vermeil (goldfill).these are absolutely stunning and the photograph does not do then justice at all !Comes in sumptuous black and gold embossed box.